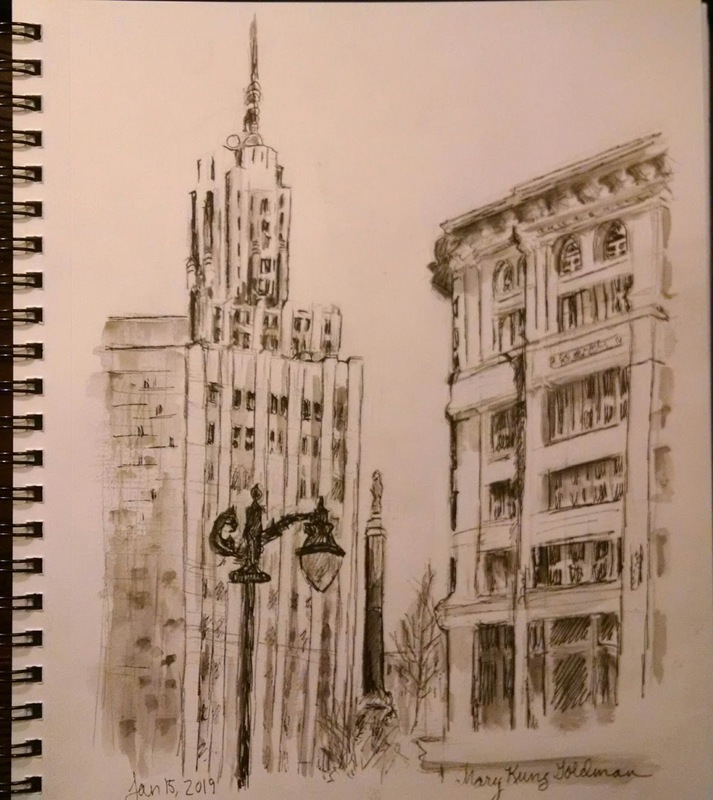 I have been sketching a lot at the downtown library. And the other day I headed over there because I was downtown with Howard and I had a couple of hours to work while he went to the dentist. On my way to the library, though, I stopped and looked around. I thought: I have drawn everything out the windows of the library that there is to draw! That was when I saw Main Place Mall. Let me check out the food court, I thought. The food court is on the second floor and perhaps there are some views. 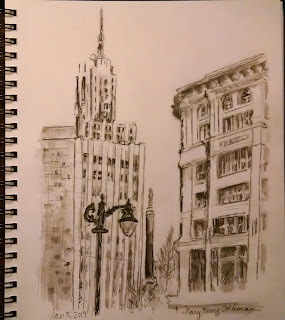 I went in and I drew the Rand Building and the Brisbane Building. There was a table that afforded me a pretty good view. And it beat drawing the same old stuff I have drawn a million times from the library. I mean, I love some of the views from the library. But there are not as many as you think. It is a strange situation you encounter in the Main Place Mall food court, I must point that out. On the one hand is the sound system. They play classical music, I guess to try to make people finish up their lunch and go. Me, of course, I love it. On this occasion they were alternating between Mozart and Beethoven, mostly chamber music, but with some piano concertos tossed in. Even with the system being on shuffle, it was heaven. On the other hand there is this garbage person who orbits the food court ceaselessly pushing this deafening garbage cart. Again, they do not want you to get too comfortable. Also there were all these guys. There are no women in the food court! It was just me and these guys. And this one guy in particular kept yapping into his cell phone. Apparently people were wanting money from him and that was what he was talking about. He had a million calls going on and to each caller he kept saying, "I'm going to call you back." True, you get in the drawing zone and you do not hear too much anyway. It fades out. But in the meantime I was getting a little stressed and I am afraid it would show in my work. Well, all is well that ends well. I liked what I did and when Howard got out of the dentist I went home with him happy. And the next day I went back again, this time with my friend Meghan who is super-artistic and sketches with me. It was exactly the same as the first day -- Mozart and Beethoven quartets, schufts and oiks, the garbage guy, no other women in the food court, uneasy cell phone conversations, the whole bit. But we were there for, yikes, almost five hours! And we did good work. Above is my second portrayal of the Rand Building and the Brisbane Building. The best part is the street lamp, to my way of thinking. I like to draw exactly what is in front of my eyes. It is a kind of souvenir. The Main Place Mall food court .... I will remember it!